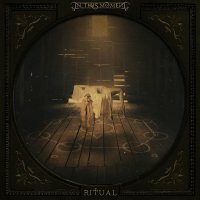 'Ritual' is In This Moment at their most restrained but that does not mean the songs are any less forceful. I love In This Moment. This is their sixth full-length release and they have never created the same album twice. They are a band in every sense of the word, but in Maria Brink they have a lead singer and focal point like few others. She has a stunning voice and an image that is the stuff of fantasies. Guitarist Chris Howorth is her partner-in-crime and no less important to the band he helped form in 2005. The current line-up is completed by bass player Travis Johnson, guitarist Randy Weitzel and drummer Kent Diimmel. 'Ritual' is In This Moment at their most restrained but that does not mean the songs are any less forceful. The theatrics and sexuality have been tempered in favour of something more concise and, dare I say it, more commercial. A down 'n' dirty Dark Blues vibe permeates the material, typified by proper opener and first single 'Oh Lord'. Brink leads her congregation through a tortured sermon, dripping with sinister energy, and anyone with a mind to worship is drawn in by the persuasive hook and addictive melody. Rob Halford guests on 'Black Wedding' and this song was made for radio. In no way related to Billy Idol's eighties offering until the punchline appears, the neat twist is that "nice day for a white wedding" has now become "nice night for a black wedding". The cover of Phil Collins' 'In The Air Tonight' varies little from the original, though the hypnotic, dreamy vocals and mid-point drum cascade are very dramatic. Brink can be anguished and passionate in the blink of an eye, highlighted by 'Witching Hour' and 'Twin Flames'. There is a smoky sensuality about the whispered delivery which sits nicely on top of a throbbing bass line, and as the verse kicks in, her devilish caress gives way to a full-frontal aural assault and everything builds to an intense climax. As usual, samples and industrialised programming embellish the caustic and melodic elements of each song, and though the guitars take a backseat somewhat, they are an essential factor in underpinning the sound. Producer Kevin Churko (Five Finger Death Punch, Disturbed, Papa Roach) brings everything together with his customary style without compromising the rawer approach. I can't wait to see some of these songs in a live setting with their trade-mark stage show. Someone get me a Kleenex, In This Moment have done it again.